What does Swiss Cheese have to do with Australian migration? How many holes must you navigate to get a visa? 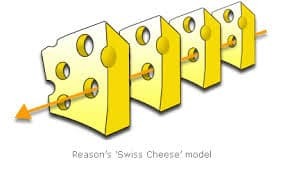 “Swiss Cheese theory” – most commonly used to explain the sequence of events leading to an accident – can also describe the Australian migration process. Imagine several slices of swiss cheese separated by equal distances. The slices keep moving and – very occasionally – the holes align, so that on rare occasions you can shoot a bullet through the holes without damaging the cheese. In Migration, so many factors must come together at the same time, in order for a visa to be granted. It might mean you have to be the right age; have the right occupation which is on the list; have a current skills assessment which is in date; have proven your English ability and hold a test which is still in date; and be able to afford the ever-changing fees. (And any of these requirements can change overnight at the whim of the Government). On a personal side; you must have the support of your family and friends for the move; the currency must be moving in the right direction in order for you to afford the visa; and you might be depending on a house sale or something else, in order to move. Then there’s the uncertainty of getting a job when you are finally in Oz… And what about the kids… how will we take them away from their friends/grandparents/cousins? Make no mistake, migrating is a massive logistical exercise, sure to stretch the most solid of relationships. When you work out the variables, and the “swiss cheese” nature of the whole exercise, it’s a wonder that anyone ever migrates at all! The “holes” might only line up once in your lifetime – are you going to be there, and take that chance? Success does not usually come without a few setbacks, so be prepared for what could be a wild but exciting ride. We’re not saying it will be easy, but we are saying it will be worth it! Need help to align the holes in your Swiss Cheese??? Contact Emergico Migration for expert help and up to date visa assistance.